Born to the French nobility; brother of Saint Humbeline. At age 22, fearing the ways of the world, he, four of his brothers, and 25 friends joined the abbey of Citeaux; his father and another brother joined soon after. Benedictine. Founded and led the monastery of Clairvaux which soon had over 700 monks and eventually 160 daughter houses. Revised and reformed the Cistercians. Advisor to, and admonisher of, King Louis the Fat and King Louis the Young. Attended the Second Lateran Council. Fought Albigensianism. Helped end the schism of anti-Pope Anacletus II. Preached in France, Italy, and Germany. Helped organize the Second Crusade. Friend and biographer of Saint Malachy O'More. Spritual advisor to Pope Eugene III, who had originally been one of his monks. First Cistercian monk placed on the calendar of saints. Proclaimed a Doctor of the Church by Pope Pius VIII. Every morning Bernard would ask himself, "Why have I come here? ", and then remind himself of his main duty - to lead a holy life. The middle of three brothers born to the peasant family of Jurgis Matulionis and Ona Juocepyte; after his mother died, his father re-married, and the couple then had seven more children. Teofilius studied at Antaliepte, Lithuania from 1887 to 1892, then Dvinsk (modern Daugpilis, Latvia) from 1892 to 1900, and then at the seminary in Saint Petersburg, Russia; he could speak Russian, Latvian and Polish. At one point he questioned his vocation, left seminary, and supported himself by teaching, but later returned to seminary. Ordained a priest of the diocese of Mohilev, Belarus on 17 March 1900. He assisted briefly in several parishes in Latvia, and on 26 June 1900 was assigned to Latgalia, Latvia. From 1910 to 1929 he was assigned to the parish of the Sacred Heart of Jesus in Saint Petersburg, an area where Catholics were a distinct minority, and where they came under increased persecution following the Communist takeover of Russia. The Bolsheviks confiscated all churches in 1922. Father Teofilius was imprisoned from 1923 to 1925 for failure to cooperate with the Soviets in the persecution of Archbishop Jan Cieplak. Chosen Auxiliary Bishop of Mohilev, Belarus and Titular Bishop of Matrega by Pope Pius XI on 8 December 1928, he was consecrated in secret on 7 February 1929. On 24 November 1929 he was arrested and sentenced to hard labour in a prison camp north of Arctic Circle for the crime of having had contact with people outside the Soviet Union. In prison he would often get up in the middle of the night to celebrate Mass in secret, distributing the Eucharist to other prisoners when possible. The privations of the prison broke his health; Father Teofilius was re-located to solitary confinement in a prison in Saint Ptersburg and finally turned over to Lithuania as part of a prisoner exchange. Chosen Archbishop of Kaisiadorys, Lithuania on 9 January 1943 by Pope Pius XII. In 1946 he released a pastoral letter to his diocese; the Soviet authorities imprisoned him for ten years for actively practising his vocation. Released in 1956, he was placed under house arrest in Birstonas, Lithuania to prevent his returning to active work as a bishop. On 25 December 1957 Matulionis consecrated Vincentas Sladkevicius a bishop without the consent of the Communists. The authorities mocked him for celebrating the consecration is his kitchen; Matuliones shamed them for forcing him to such a reduced state. For his disobediance, the Communists exiled him to Seduva, Lithuania for the rest of his life. Martyr. Born to a pious and educated upper class family. Though women of her day were forbidden a formal education, she learned to read and write, and much about her faith at home from her father. Being an upper class girl of the time, she grew up isolated and self-involved, but in her mid-teens she felt the hollowness of her life, and began to search for more meaning. She prayed for enlightment and received a mystical vision that led her to leave home and wander the roads, explaining the love of God to any who would listen. At age 17 she attended a mission preached by Saint Gaspare de Bufalo, and saw the obvious changes to people who attended. She wanted to have the same effect, and with the aid of Venerable Giovanni Merlini she founded the Congregation of the Sisters Adorers of the Blood of Christ in Acuto, Italy on 4 March 1834, a woman's congregation for teaching girls. She expanded their work to teaching and catechizing women and boys. Though, due to the social mores of the time she was not allowed to speak to men, they would often gather on their own, sometimes in hiding, to listen to her teaching. Pope Pius IX assigned her to running the San Luigi Hospice in Rome, and from there she worked to expand the Adorers. The congregation experienced occasional opposition from the clergy, but always support from the laity; they ran 70 schools by Mary's death, most in small isolated towns, and over 400 by her beatification. Mentioned in Gospel of Luke as the short tax collector who climbed a tree in order to see Jesus because he couldn't see over the crowd. Jesus decided to go to the man's house, and when the locals grumbled that Christ was friendly with sinners, Zacchaeus showed his conversion by making retribution to any he had harmed, and by giving largely to charity. Since that's all we actually know, many legends have grown around him, including that he married Saint Veronica, that he became bishop of Caesarea in Palestine, and that he is Saint Amadour who was an early hermit in France. Now a man there (Jericho) named Zacchaeus, who was a chief tax collector and also a wealthy man, was seeking to see who Jesus was; but he could not see him because of the crowd, for he was short in stature. 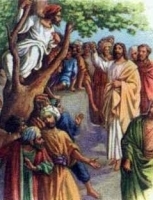 So he ran ahead and climbed a sycamore tree in order to see Jesus, who was about to pass that way. When he reached the place, Jesus looked up and said to him, "Zacchaeus, come down quickly, for today I must stay at your house." And he came down quickly and received him with joy. When they all saw this, they began to grumble, saying, "He has gone to stay at the house of a sinner." But Zacchaeus stood there and said to the Lord, "Behold, half of my possessions, Lord, I shall give to the poor, and if I have extorted anything from anyone I shall repay it four times over." Born a prince, the son of King Osric of Deira in Britain. Educated by Saint Aidan. Succeeded Saint Oswald of Northumbria as king of Deira in 642. Saint Bede describes him as "most generous to all men and above all things humble; tall of stature and of graceful bearing, with pleasant manner and engaging address." While his reign was one of peace and order, there was constant political wrangling with his cousin Oswy who desired the throne and eventually had him murdered. The only son of a member of the court of King Dagobert I. Educated by Saint Ouen of Rouen. Monk of Rébais Abbey at age 20. Abbot of Rébais. He spent some time travelling to various monasteries, studying their Rules, constitutions and methods of mangement. Founded Jumièges Abbey on land he received as a gift from King Clovis II. He created a Rule for the Abbey, and served as its first abbot. Imprisoned and then exiled for opposition to Ebroin. Founded the monastery of Noirmoutier. 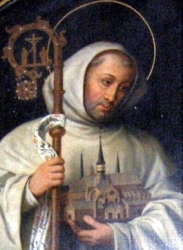 Abbot of Luçon Abbey. Returning from exile, he founded the monastery of Cunaut and a convent at Pavilly, and helped restore Quinçay. The filbert, or hazelnut, is said to have been named for him as it ripens in England around the time of his feast day. Giovannni early changed his name to Bernard from admiration for Bernard of Clairvaux. Educated by his Dominican uncle. His father prevented Bernard from entering religious life. Lawyer. Theologian. Soldier. Politician and government official. Struck blind, Bernardo recovered his sight through the intervention of the Blessed Virgin Mary, after which he gave up worldly life to become a hermit. Accused of heresy, Bernard soon cleared his name. Priest. Founder of the Benedictine Congregation of the Blessed Virgin of Monte Oliveto (Olivetan Congregation; Olivetans). During a bout of the plague, Bernard and his monks cared for any who needed it; none of the brothers became sick. Son of Lendmann Kol Kalisson and Gunhild Erlendsdotter, and described as "elegant and accomplished". Appointed Earl of the Orkney and Shetland Islands by King Sigurd I of Norway in 1129. He made a vow to build a church in his lands; the result was the Saint Magnus Cathedral in Kirkwall, Scotland. Murdered by a group of warriors rebelling against him, his rule and his religion, and is considered a martyr in Kirkwall. Son of Narciso Cardona and Domenica Meseguer. Soldier. Joined the Piarists on 25 June 1929, and made his solemn profession on 15 August 1934. Priest, ordained on 11 April 1935. Served in Barcelona, Spain. Martyred in the Spanish Civil War. The last Judge of Israel, described in the Old Testament book of 1 Kings. The son of Elcana and Hannah, who vowed before his birth to give him to God. Delivered the Israelites from the rule of the Philistines (1 Kings 7). Believed by some to be the author of the books of Judges and Ruth, and the first 24 verses of 1 Kings. 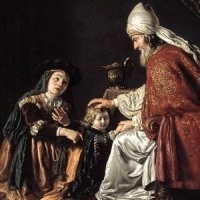 In his old age he appointed his sons judges over Israel, but they displeased the ancients, who asked him for a king, and the Lord told him to anoint Saul (1 Kings 8). Benedictine Maurist priest. Imprisoned on a ship in the harbor of Rochefort, France and left to die during the anti-Catholic persecutions of the French Revolution. One of the Martyrs of the Hulks of Rochefort. Priest in the Archdiocese of Gniezno, Poland. Imprisoned, abused and martyred in the Nazi persecutions. Priest in the diocese of Würzburg, Germany. Arrested by the Nazis and sent to die in the concentration camps for his faith. Martyr. 4th century imperial Roman government official in Cyrene, Africa. He witnessed the faith and martyrdom of Saint Theodore of Cyrene, which led to interest in Christianity and eventually his conversion. Retired to the island of Cyprus to live away from the empire, but was one of a group of Christians martyred in the persecutions of Diocletian. King of Northumbria, England for 20 years after which he abdicated and retired to spent his last ten years in prayer and seclusion in a monastery in York, England. Monk at the Saint Martin de La Rojana monastery near Cordoba, Spain. Martyred in the persecutions of Abderrahman II. One of the first Christian hermits in Gaul with a cell at Quercy. Body found incorrupt in 1126, about a thousand years after his death. Bishop at Le Mans, France. Founded several monasteries including Notre-Dame-d'Evron. Monk at Lobbes Abbey in Belgium. Canonist. 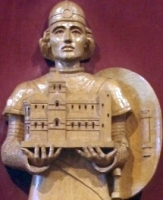 Reluctant bishop of Worms, Germany in 1006. Martyred with several hundred companions during the persecutions of Shapur II. Archbishop of Conze, Basilicata, Italy. Count of Apremont. Crusader. Benedictine Cistercian monk at Villers, Brabant, Belgium. Priest. Monk in Cordoba, Spain. Martyred in the persecutions of Abderrahman II. Spiritual student of Saint Martin. Founded the monastery of Chinon in France.